A woman being hunted for by police disappeared for two months by becoming a resident a Blackpool hotel. Forty-year-old Paula Wilkinson’s whereabouts only came to light when she was stopped in the street and searched by officers investigating a complaint of theft. A lock knife fell out of Nicholson’s hand-bag and she was arrested for having the knife in a public place. Her lawyer Gerry Coyle told the hearing:”My client was wanted by police over a shoplifting matter in another part of this county. Nicholson who gave her address as the hotel on Shannon Street admitted two shoplifting offences at a branch of the Co-op and at a Debenhams store, breaching her probation order by failing to keep appointments and possessing the knife. She was sentenced to six months in jail, suspended for a year with 20 rehabilitation days and fined £10. The court heard that Nicholson who is on benefits had drug issues and maintained she only had ther knife to scrape out her pipe. A 38-year-old man has appeared at court charged with witness intimidation. Tattoo artist Lee Bacon denied the offence. He also denied harassing the same woman in offences alleged to have taken place in Garstang. Bacon from Northampton will stand trial in Blackpool on June 21. He was granted bail on condition he doe not enter Lancashire apart from court appearances. A man has made his first appearance at court charged with stealing an expensive pedal cycle. Magistrates agreed to transfer the case to Bolton Magistrates after hearing that the owner of the bike, valued at, £6,900 is a probation officer. Leon Olive, 34, of Claremont Court, Blackpool admitted the offence. Andrea Fawcett prosecuting said the bike had been recovered. Olive did not apply for bail and he remanded in custody until his Bolton hearing on Friday, April 5. A 41 -year-old Blackpool man has been remanded in custody pending his trial for burglary. Gary Skelly of Lytham Road, South Shore, denies burgling a property on Back Warbreck Road . Magistrates sent him to Preston Crown court for trial where he will appear on May 1. A man went on the railway line at St Annes station telling police who were called to the scene that he was looking for his mobile phone. The 35-year-old old from St Helens was heavily intoxicated. Geoffrey Bromilow admitted being drunk and disorderly. The court heard that Bromilow had jumped onto the tracks in front of worried members of the public. He was fined a total of £155. 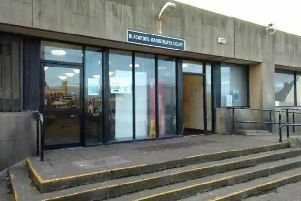 A Blackpool man has denied being drunk and disorderly in the town’s Winter Gardens complex. Lewis Jones, 32, of Lytham Road, South Shore, was granted bail by Blackpool Magistrates and his trial will take place at the same court on June 5. A man has pleaded not guilty to breaking his bail conditions. Dean Rusling, 38, of Warbreck Hill Road, North Shore, is alleged to have gone into Chester Road, Blackpool, where he is forbidden to go. Hew is also alleged to have contacted his ex partner who lives in that road which is also forbidden. Rusling denied the breaches and he was bailed until his trial on June 7.